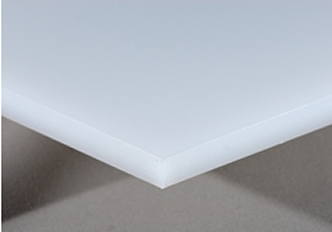 Polypropylene is an economical material that offers a unique combination of outstanding physical, chemical, mechanical, thermal, and electrical properties. It demonstrates excellent resistance to corrosion, organic solvents, degreasing agents, and electrolytic attack. It is also lightweight, stain-resistant and has a low moisture-absorption rate. Polypropylene is a tough heat-resistant material up to 180°F, making it ideal for the transfer of hot liquids or gases. Polypropylene homo-polymer is USDA/FDA, NSF and 3-A Dairy compliant in natural color for use in meat- and poultry-packaging facilities. This material demonstrates excellent impact resistance and formability, while also being lightweight. It also has outstanding chemical resistance and performs well in corrosive environments. Colors: Natural (translucent white), white, black and blue. Polypropylene co-polymer offers the same chemical resistance of homo-polymer along with the added benefit of better resistance to stress cracking at low temperatures while being more pliable. Polypropylene also is available in two flame-retardant formulations. Both offer the best overall fire-resistant qualities of any competitive FRP material. This flame resistance, however, does not come at the expense of aesthetics and high performance. The range of sizes and shapes are grade specific, please contact us for more information.